We've also included a hyperlink document of the Comprehensive Rules for your convenience. Comprehensive rules in the near future. While we here at Punch-It Entertainment don’t have an official deck building tool. One of our fans, produced a deck building program for the game and gave us the code and database for use. We love this tool and hope enjoy using it yourself! We love communities here at Punch-It Entertainment, and we have seen a rapidly increasing use of Discord across multiple different games. Discord gives us an opportunity to interact with each of you in real time, answer questions on rules, and arrange pickup games through Tabletop Simulator. We look forward to seeing you all on the server. Errata – Construction Cost. Original value was 1. New value is 2. Restriction – Number of copies in play deck. Players can only have 1 copy of Furtim Braccae in their play deck when used in 60/90 constructed-format tournaments. Errata – Construction Cost. Original value was 2. New value is 3. Restriction - Number of copies in play deck. Players can only have 1 copy of Dr. Lehner “Time Hopper” in their play deck when used in 60/90 constructed-format tournaments. 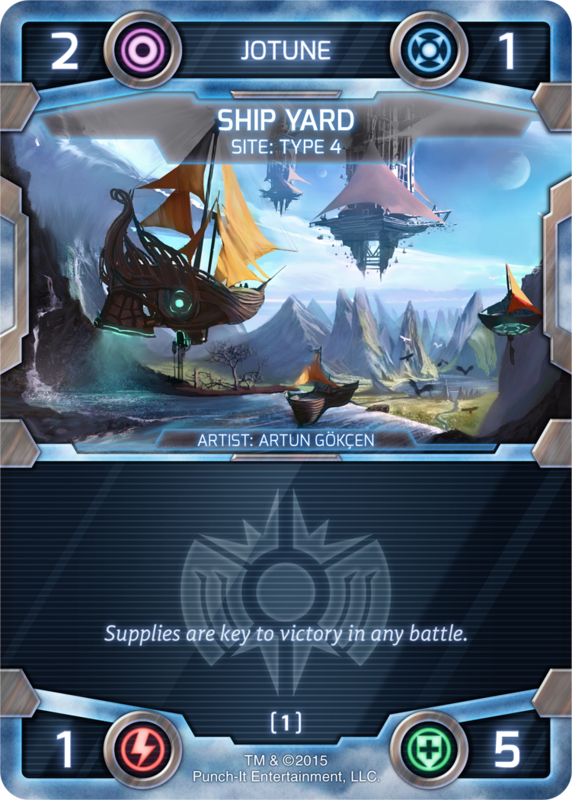 Q: I'm opening my battle kit and don't see the preconstructed decks, where are they? A: A battle kit sorts the cards inside into two groups: Synthien and Jotune, with Mercenary cards mixed throughout. 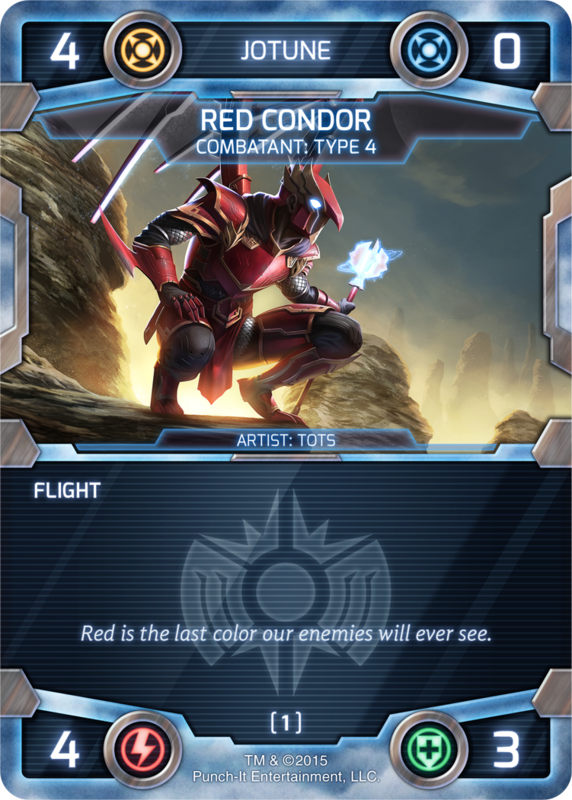 The first 60 cards in each faction's card pack are the preconstructed decks. You can also find the decklists here. 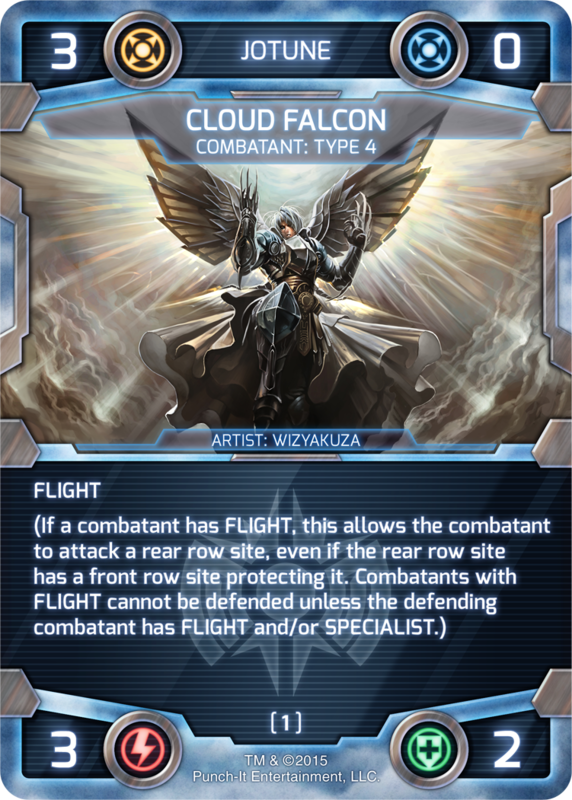 Q: If I had three Jotune combatants with FLIGHT, and each had BARRAGE 1:2 from Fire from the Sky, could I use a combatant to take out the site weakened by the barrage damage? Q: When does the Bolthorn Warlord’s ability give it and all Joint Strike Force combatants attacking with it +3/+0 in the attack? A: The Bolthorn Warlord’s ability is a required triggered modifier that occurs after attackers and defenders are declared and when Bolthorn Warlord and any others gain the keyword value JOINT STRIKE FORCE and ATTACKER (See comprehensive rules: H. Attack Phase > 3. Steps of the Attack Phase > d. Keyword Value Step) . 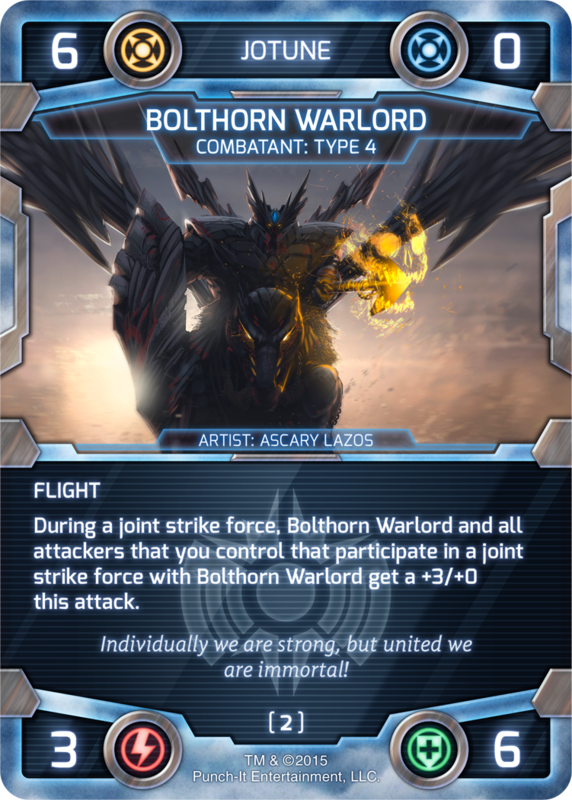 This means that during the keyword value of the attack substep the Bolthorn Warlord and all other attackers in the joint strike force with him get +3/+0. Q: What happens if the Bolthorn Warlord is removed from the attack? A: If an ability or effect would activate, reset, or remove an attacker from play before it reaches either the alpha strike or normal damage step, that combatant is removed from the attack and any modifiers which may have triggered from it being part of the attack are removed from the attack. Therefore, all combatants attacking in a joint strike force with a Bolthorn Warlord that has been eliminated, reset, or activated before either of the damage steps would lose the +3/+0 bonus before they can apply their attack value. If the Bolthorn Warlord is removed as part of the normal damage dealing process in either the alpha strike or damage steps of the attack then the +3/+0 modifier will still apply to all objects until the end of the attack step. Q: If Spoils of War is defused, does this shut off its sularium generation? A: Correct, when Interference is played it will turn off the printed sularium generation of one it has printed in the upper right-hand corner. 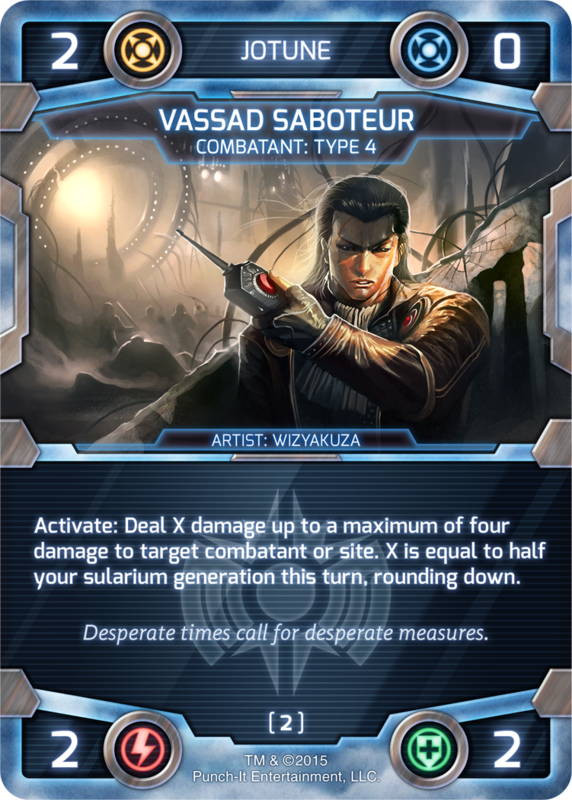 If a defuse effect reads, "defuse target condition card," then all effects generated by that card, including sularium generation no longer function; the card will however continue to generate influence and contribute to threshold as long as it is still in its owner's influence row. Q: Is the sularium counter placed by Spoils of War onto a site still active and provide additional sularium? A: Yes, The sularium counter is still active and provides one additional sularium. Spoils of War itself is makes the sularium counter when Spoils of War is played. After resolution the counter operates independently from the Spoils of War card that generated the counter, it is just allowing you to put a sularium counter into play and instructing you how the sularium counter functions in gameplay. Q: If I have multiples of a card like Spoils of War, Art of War, or Fire from the Sky, do all of these conditions stack? A: Yes, all conditions are active and their abilities and effects stack. For example, if a player has two active Spoils of War in play, the Spoils of War cards will generate a total of +2 sularium generation, and the two counters they made will generate another +2 sularium generation, for a total of +4 sularium generation (in addition to any other sularium generated). If a player controls two active Art of War's, and each is granting +1/+1, these will stack to give their Jotune combatants +2/+2. 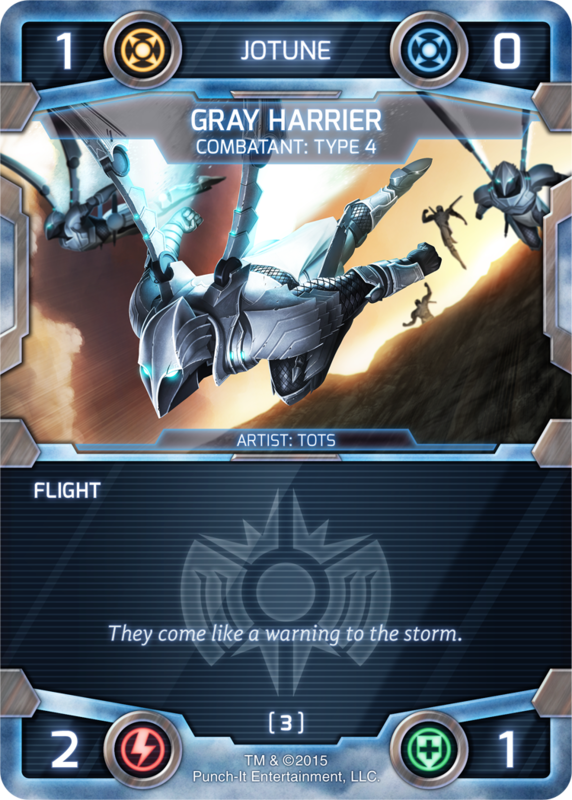 If two Fire from the Sky's are active, then each combatant with FLIGHT they control will get two triggers of BARRAGE 1:2 when they become an ATTACKER. The Battle Begins starter set sorts the cards inside the box into two card packs. These card packs feature the two main factions – Synthien and Jotune, with Mercenary faction cards mixed throughout. The first 60 cards in each card pack (when viewed from the face card of the card pack) makes up a starter deck – one for each player. 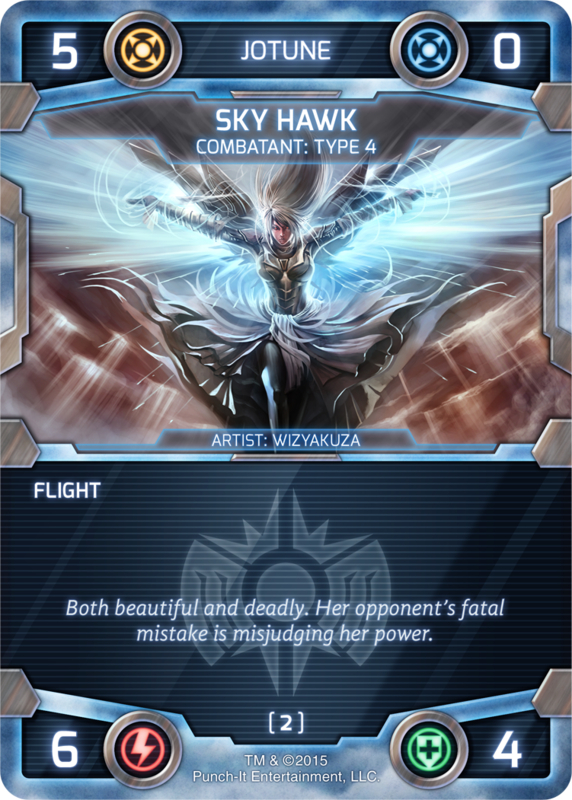 Each starter set contains enough cards for two players to play against each other in a constructed format, or two to four players in a draft format. You can confirm your starter decks by reviewing the list below. Once you become more familiar with the game, we encourage you to make your own custom-designed play deck using our 60/90 deck construction rules. 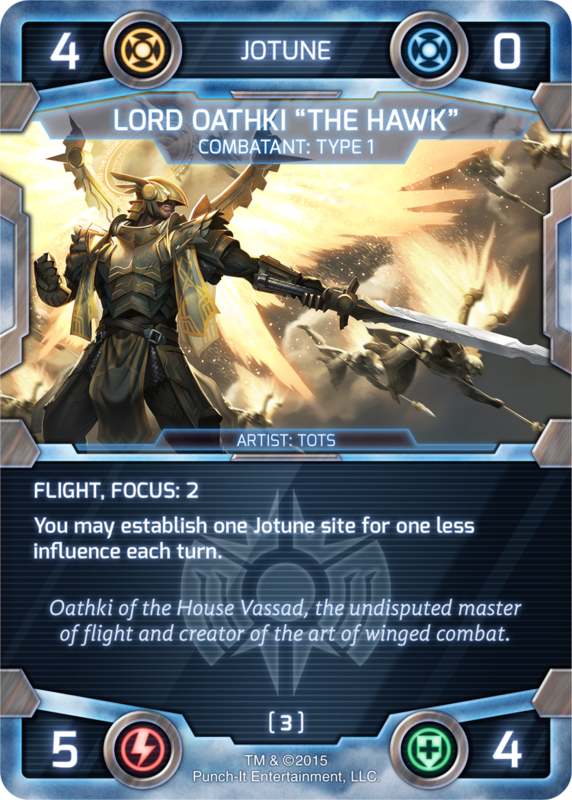 The Jotune faction was designed to feature aggressive combatants with a host of options to increase their over-all fighting power. Affectionately referred to as space vikings by our development team, the Jotune should never be underestimated. 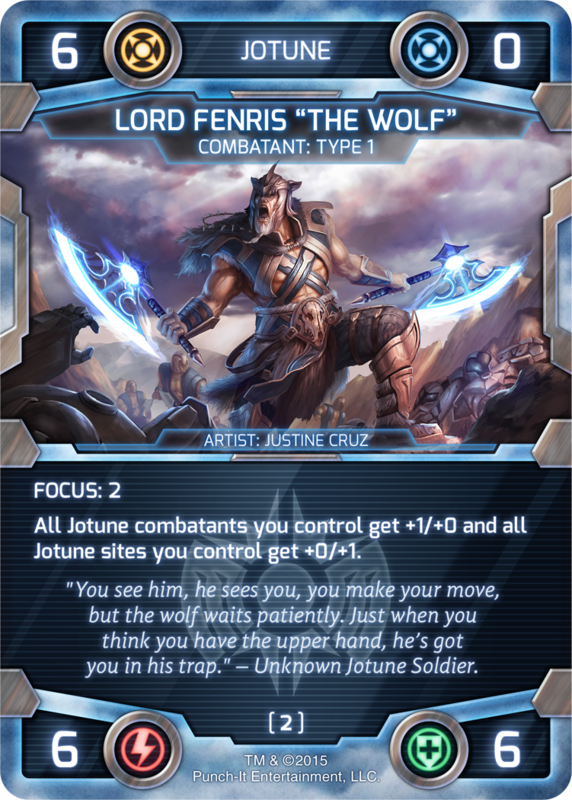 Even with only a few combatants on the table, the amount of damage they can output, through the help of cards like Lord Fenris "The Wolf" and Art of War, can typically overcome a greater number of foes. The Synthien were designed to be more of a utility faction. They may have access to large combatants or focus their sularium resources into powerful energy beams – essentially fighting from a distance for when the superior fighting forces of the Jotune become too overwhelming. 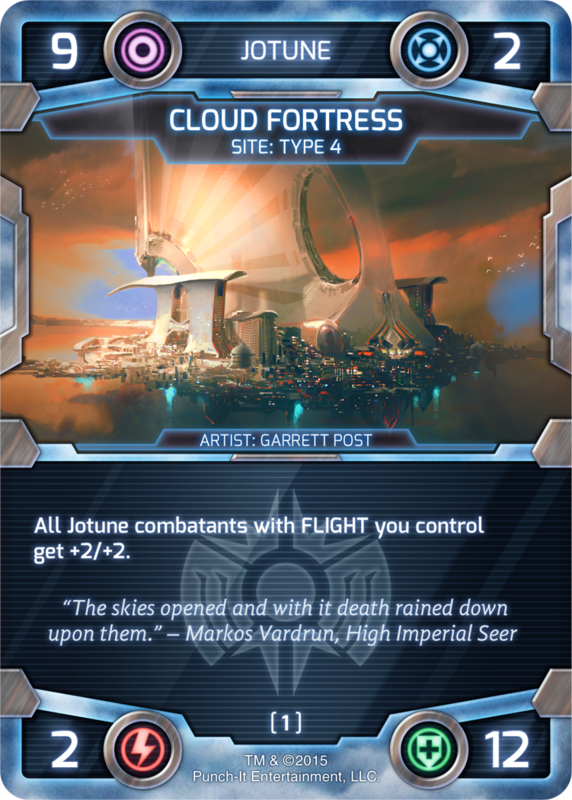 Ultimately, it is this faction's ability to generate large amounts of sularium through cards like Master Mining Program, that puts them into direct conflict with the Jotune. Check your Basic Rules Guide included in your copy of The Battle Begins or the online FAQ. For more in-depth rules, search the online Comprehensive Rules. Hi and welcome to the Punch-It Entertainment Alpha Tester Program. Below you will find a brief form that is required in order to process your application to become a tester for Battle for Sularia. Here are a few key items to consider before making an application. Punch-It Entertainment is looking for dedicated players to provide valuable and necessary feedback from which meaningful information can be ascertained for the sake of improving the game play experience of each and every release for Battle for Sularia. Punch-It Entertainment will credit each participant in the rules insert or rules book for any game that a tester participates in who provides a minimum of 25 games of feedback. Punch-It Entertainment at any point reserves the right to remove a tester from the program, if the tester is not providing valuable feedback or participating in the program. Testers accepted into the program may be removed if their behavior in official company forums such as Reddit is disruptive or detrimental to a successful testing environment. Punch-It Entertainment has a very specific testing process that collects valuable data that is used to look at Macro levels of information regarding each individual faction in Battle for Sularia. While this data is valuable to the overall experience and balancing of the meta for a given release, it cannot give us the entire picture. This is where player psychology and perception becomes very valuable for us. Punch-It's tester feedback form allows for a very detailed response of each game that was played in both quantitative and qualitative data. We value the qualitative or non-numerical data more so over traditional quantitative data. Because of this, each tester plays a very integral part in improving the overall quality of each release. In return for your feedback Punch-It Entertainment will make every effort to effectively communicate with our testers and provide as much data as possible. The testing process at times can be a frustrating experience, and it requires a player who is patient and able to communicate these issues back to us effectively. If you feel you are up to that challenge the reward is that you will be able to directly effect and shape the future of Battle for Sularia. A Reddit account is required to participate in the Battle for Sularia Alpha Test. On occasion Punch-It Entertainment may ask you to participate in a Skype call with he developers to discuss your test results. Check all that apply. | Project Z – Tile-laying board game of perfect balance. Designers: Jesse Bergman & Matthew Greenleaf. | Project D – Fast-paced card combat game. Designer: John Kimmel. | Project P – Party game for 4-8 players. Designer: Matthew Greenleaf. Thank you! Your application has been received and will be reviewed by the Development team. You should hear a response from us in the very near future. Please do not contact us directly about your application.